For a few months in the late 90’s, I was unable to use my right hand for much. Where a young adult bloke might have good cause for a calloused palm, the reason I perpetually looked like I was presenting stigmata was Mario Party on the N64. Some of its mini games, most notably Paddle battle, required rotating the N64 controller’s hard analogue stick – something that was considerably easier and faster using one’s palm than the thumb as intended. Since then, Nintendo’s wisely kept rotating sticks out of its party games instead of crippling its fans – but it hasn’t stopped the company from releasing a new Mario party very nearly every year. As the years have gone on, it feels like there’s perhaps been a downward spiral; there’s been very little in the way of innovation, with each new Mario Party feeling like a rehash of the one that came before. 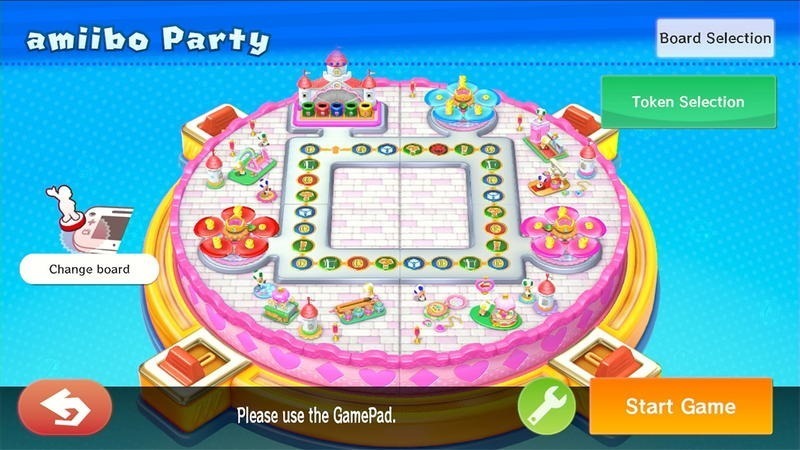 Mario Party’s particular brand of mini-game infused digital board-gaming has always had a modicum of popularity, largely because they’ve very nearly always been fun. For the first time, I feel that it’s run out of even that. 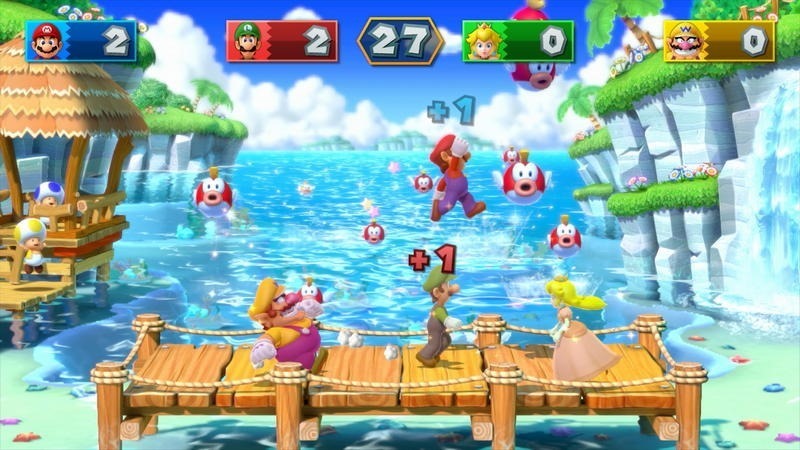 Mario Party’s never really been one of the house of Mario’s most polished or considered franchises, instead feeling more like budget titled handled by a B-Team, using ideas and concepts recycled from previous games. Never has that felt more apparent than with Mario Party 10. In fact, it feels like it was largely cobbled together from bits of Mario Party 9, given an HD spiffing and stapled together with Amiibo support. 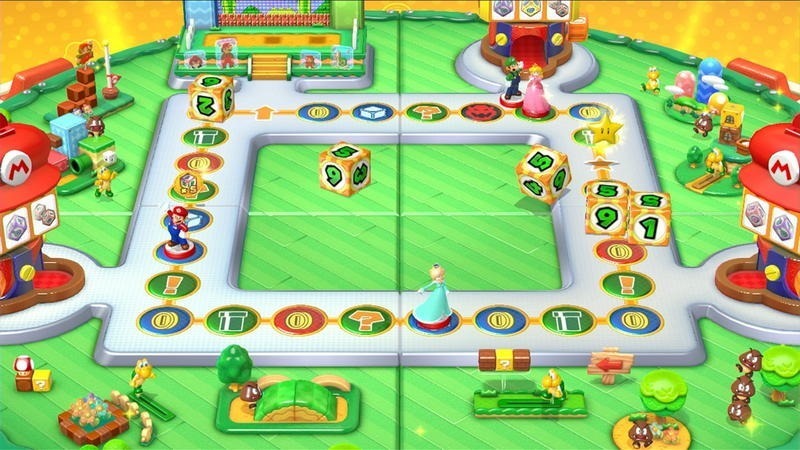 Much like with Mario Party 9, all players move together around a series of themed boards, with the goal being to collect the ministars that litter the board and can be picked up while traversing, or won during minigames. 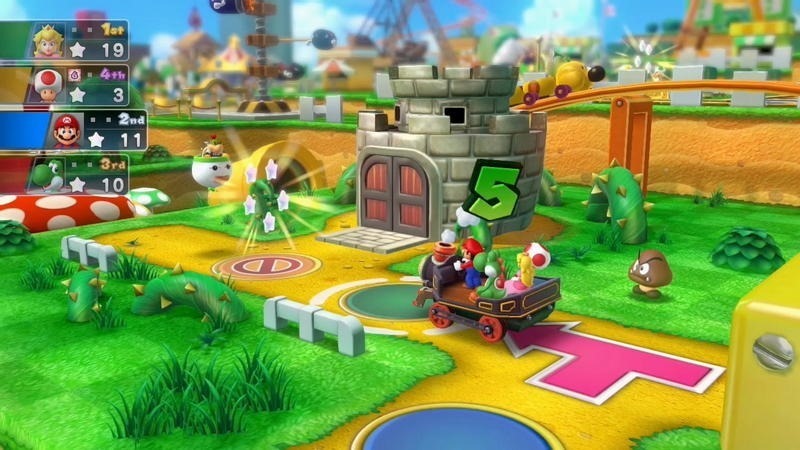 In the main mode, Mario Party, up to four players travel around the boards together on a single vehicle, dispensing with the splintered paths of old. The driver rolls the dice, moves everyone forward, and takes the benefits or disadvantages of the spot they land on, and then it’s the next player’s turn, streamlining the whole affair. Everyone moves together on a linear path towards the end, facing off together against two bosses each round. Like with the last game, items are absent, instead replaced with collectible dice bearing smaller sets of numbers. Instead of rolling the standard 6-numbered, die, for example, players can opt to use a 1-3 die in an attempt to make sure that the next player lands on the unlucky spot that’s 5 blocks away. It adds the most rudimentary level of strategy to the game – though it must be said that the biggest decider in everything is still lady luck. Every so often, instead of landing on yet another block awarding you new dice, you’ll get to play a minigame that can help shift the balance of stars. They’re usually where Mario Party shines – because it’s always fun facing off against a couch full of friends or family in a quick game of wits or reflexes. Most are free-for-all, with each man for himself, though a handful pit two-on-two, or one-on-three. Sometimes there are even slower, more thoughtful challenges; tests of memory or pattern recognition, but most of the games are over within a few seconds. They do help liven up proceedings, but in my experiences they’re too rare, only coming up three or four times in a single game. Some of the minigames this time around seem uninspired, rehashes of previous games – with the odd few standouts. There’s a wealth of variety in them though, with over 70 minigames on offer – so you;re bound to come across ones you like and ones that feel a little too familiar. ‘A secondary mode, Bowser party, spices things up a little. It pits a fifth player, controlling Mario’s perpetual nemesis, against the rest as he chases the team’s progress with dice rolls of his own. When he lands on the team’s vehicle, we get to play the asynchronous multiplayer games made for the Wii U gamepad. Mario Party 10 actually uses the Gamepad rather well here, and you’ll play games that are a little more interesting, like one that has Bowser blowing in to the mic, unleashing giant fireballs on the main screen for the other players to dodge. Another mini game of its ilk has Bowser using the gamepad’s gyroscopes to move an intersection of fireballs across the screen to burn the bums of the team and have them relinquish their stars. If Bowser manages to get them all down to 0 ministars, he wins – and if not, it’s game over for the great big lizard. The final bona-fide mode not only integrates Nintendo’s new Amiibo toys, but requires them, like a bit of real-world DLC. 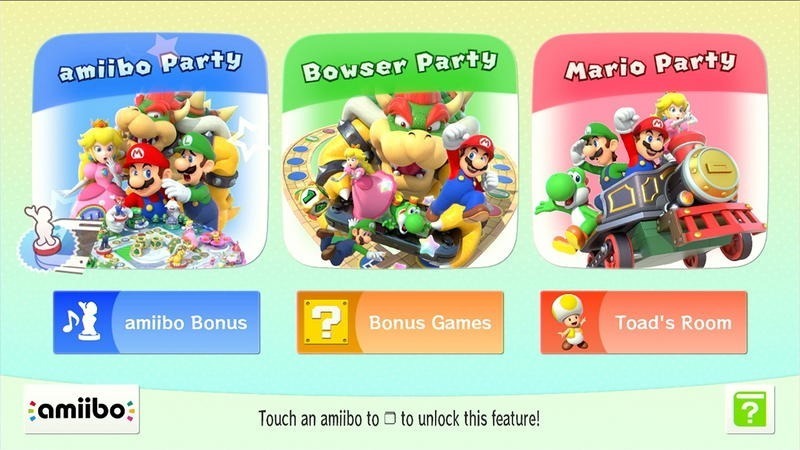 You’ll need to tap one of the nine supported characters to the GamePad to unlock the mode, which attempts to bring back the classic Mario Party style of play. Instead of a sprawling board, there’s a plain and simple square one, with the goal this time being to collect coins and use then to purchase great big gold stars. It’s similar enough to the Mario Party of old, save for the Amiibo integration. In theory, it’s a fantastic idea; use the real world toys as your game pieces, and tap them to the Gamepad whenever you’d move your piece in the game. In practice though, it’s annoying and cumbersome. You have to tap your Amiibo to the pad for each and every move, even using the toy to roll dice by tapping them on the pad again. With the relatively slow pick up and transfer rates of the embedded NFC chips, it becomes unbearably tiresome waiting for the Pad to pick up the Amiibo all the time, especially when you’re playing with four Amiibo. Amiibo can also be used to unlock new game boards in the Amiibo party mode, adding an aesthetic – but not functional – overhaul on a whim. While it’s meant to appeal to old fans, the whole mode feels like it’s been lazily thrown in, shoe-horned as an unnecessary, Amiibo-selling cash grab. Once again, the Party Points you earn just by playing the game can be used to unlock new vehicles, extra characters and other silly bits and baubles. Also included in the package are a few bonus games, like a serviceable Badmington game and a Jewel Drop game that plays a bit like Bust-a-Move duct-taped to Dr Mario. It’s not bad, but the whole thing this time feels uninspired and ultimately too familiar. 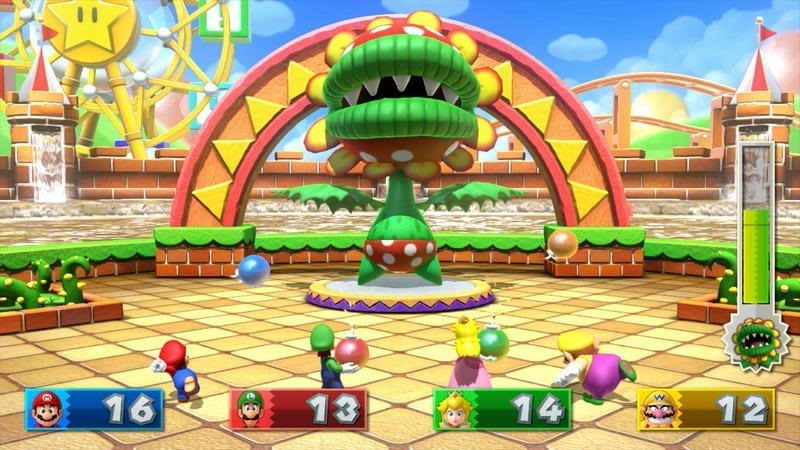 It’s essentially Mario Party 9 all over again, given an HD makeover. Admittedly, it does look rather good. It’s vibrant and colourful, sporting the same sort of aesthetic that made Mario Kart 8 one of last year’s best looking games. If you appreciated the streamlined vehicle approach introduced in Mario Party 9, and have yet to bored silly by mini-games you’ll probably enjoy the vast amount of content that on offer here. It’s hard, however, to shake the feeling that we’ve seen, and played this all too many times before. Every big game to look out for in 2015!